Take in important works of art while walking the hallowed halls of the always-free Menil Collection in Montrose. 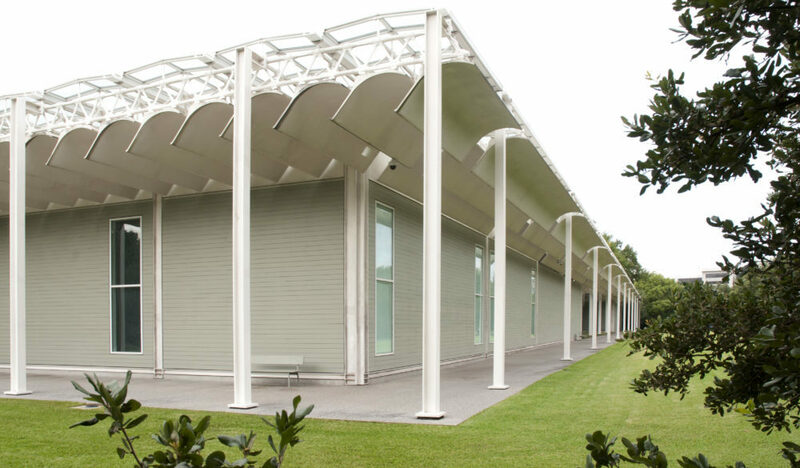 Since 1987, the Menil Collection has served as a provider of the arts, from ancient to contemporary, nestled in a residential neighborhood of Houston. Situated among lush greenery and quietude not often found in Montrose, the Menil tours visitors through the unparalleled collection of founders John and Dominique de Menil. Following a 2018 renovation, the Menil has once again opened their doors, offering intimate viewings of astounding artworks while maintaining a connection between indigenous arts and contemporary works. 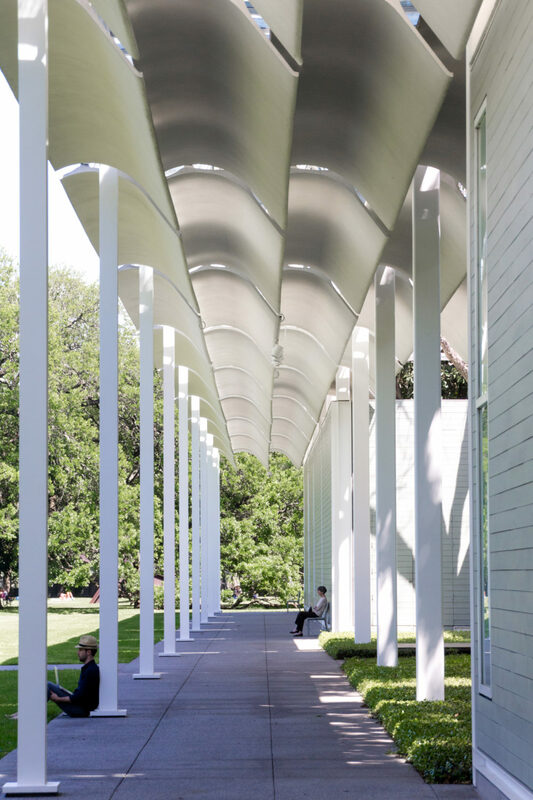 The Menil campus serves as one of the most transportive areas in all of Houston. Just blocks from two of the city’s busiest roadways, the engrossing natural environment beckons park-goers and art-enthusiasts for meditation and relaxation in an area that feels untouched by Houston’s hustle and bustle. Sprawling from the main building, the grounds of the Menil Collection include several understated buildings, in trademark grey and white, amid lawns dotted by sculptures, magnolia trees, bamboo shoots, and old oaks with drooping branches that glance off the ground and back into the air again. Italian architect Renzo Piano has left his mark across this campus, most notably in the main building that rests on the corner of Mandell and Sul Ross. Adhering to the instruction of Dominque de Menil, Piano created a building that appears “small on the outside, large on the inside”. Here, the wavy louvers that adorn the top of the museum provide a distinctive decorative flair as well as channeling natural light throughout the interior spaces. Inside, black pine floors contrast with starkly white walls to produce a levity for visitors that might be quite different from the heaviness museum-goers often experience at larger institutions. By design, this is not a place for photography. While photos are allowed within the hallway, photography is not permitted within the gallery spaces so that viewers are embedded within a contemplative atmosphere and better able to have more intimate encounters with the artwork. The two wings of the Menil Collection provide diverse experiences from vastly different geographical areas and time periods. To the left of the main entrance, viewers explore the ancient and medieval arts before encountering a robust display of African art. Native North American and Pacific Islands pieces are also displayed, providing a contrast with many large-scale contemporary works that round out this side of the museum. In the opposite wing, viewers encounter an extensive collection of Surrealist art and an impressive display of the Menil Collection’s cherished Modern works. Though these two wings may appear from very different worlds, the Menil Collection serves as a way to explore the formal and spiritual connections between modern works and arts of ancient and indigenous cultures. Through the gallery of ancient works, viewers will find pieces from the Mediterranean, North Africa, the Near and Middle East, and Asia from a wide range of time periods that provide a visual history of human civilizations that reach as far back as 15,000 BCE. Turning the corner from ancient works brings viewers into an exploration of artwork from the Middle Ages. The distinctive area of this gallery revolves around a small side room coated in a deep navy color that sets it apart from the surrounding white walls. Here, religious art bursts with pops of color and gold leaf, highlighting different biblical scenes and saints by Greek, Balkan, and Russian artists. On a pedestal in the center, a sixth-century reliquary rests for viewers to peer over the small object that would contain a holy relic. Finally, a strong display of African works, including more than 60 masks, figural sculptures and shrines, and vessels from regions of West and Central Africa, provide a tour for visitors through a nuanced examination of the often confrontational relationship between Africa and Europe. The works here touch on the histories of slavery, colonialism, and racism while also providing a direct link from the powerful works by indigenous peoples to the surrealists on display elsewhere in the museum. Before ducking into the next gallery, take a moment in the hallway to explore the collection of masks and small figures from the Pacific Northwest region of North America. Be careful not to miss the tucked away figurine from the Punuk region of Alaska, dating to between the fifth and tenth century. This small figure of a head is hidden in a narrow passage behind the displays of masks, and visitors are provided one of the most intimate viewings of an artwork throughout the museum. The Pacific Islands gallery is a one-room area that examines masks, body ornaments, textiles, ceremonial objects, and musical instruments from the regions of Polynesia and Melanesia. Taking center-stage in this room are three towering sculptures made of tree fern, clay, and wood that begin to prime visitors for considering large-scale works that are spread throughout the rest of the Menil Collection. Transitioning into pieces from within the last century, the contemporary gallery presents artworks from post-war Europe, living artists that defy classification, and some of the most recognizable names along with their internationally-renowned pieces. Through the entrance, French artist and sculptor Yves Klein dominates the vision of visitors. Along with one of his signature, saturated blue pieces hanging to the left, his work Blue Rain is presented, for the first time, over a pit of blue pigment. This airy work features blue wooden rods hanging over the pigment in delicate suspension. Throughout this gallery, Menil Collection is flowing at its best, with surprises lurking around every turn and in every nook that you may be liable to miss — like Christo’s 1966-67 work, Corridor Store Front, which is hidden within the white wall that separates Blue Rain from the rest of the gallery behind. Elsewhere in this gallery, Richard Serra’s Two Corner Cut: High Low provides an off-kilter experience for visitors standing at the end of an enclosed hall between two massive rectangular sheets of black linen that fill the viewer’s periphery. Finally, Cy Twombly’s 1970 monumental work Treatise on the Veil serves as a museum highlight, spanning the length of the gallery with Twombly’s spikes of dreary, runny greys and blacks slashed with a musical staff and the artist’s trademark scrawls. Within each wing of the Menil Collection, a one-room gallery offers a chance for temporary exhibitions to highlight specific works or themes within an artist’s portfolio. From the obsession of Mickey Mouse iconography by Claes Oldenburg to the minimalist sculptures of Leslie Hewitt or a previous screening of Andy Warhol’s Sunset film, the Menil’s rotating galleries provides a chance to periodically freshen up the museum with close-up exhibitions involving the expansive collection. A significant collection of artwork, the Surrealism exhibit at the Menil Collection gathers pieces from major artists of the movement, including Max Ernst, Wifredo Lam, and Man Ray. Under dim lighting and on darker walls, this area of the museum displays a unique collection not found many places, made even more special by Witnesses. In Witnesses, found within the Surrealism gallery, a side room brings the viewer into a startling environment filled with a staggering array of personal belongings and items that helped to inform the inspiration for many surrealists. With bird specimens, masks, kachina dolls, and a leather suit with wooden and metal spikes, these pieces represent art from a range of cultures that allowed surrealists to form an art movement that questions the nature of reality itself. Another highlight within the Surrealism gallery is the room adjacent to Witnesses, featuring eleven artworks from one of the premier artists of the movement, René Magritte. Feel free to make use of the benches in this room so there’s enough time to absorb the absurd details in his work. Such as in his 1963 piece, The Telescope, which uneasily disrupts the viewer’s belief of reality while looking through an ajar window onto a pristine skyscape of idyllic clouds. And in Golconda, Magritte suspends our understanding on a field of smartly-dressed men in coats and bowler hats floating (or falling?) over the rooftops below. Throughout the Surrealism gallery, each of these works requires an extra moment of examination to pull out all the details, absurdity, and unsettling notions masked within the innovative artistic movement. A wonderful way to wrap up a visit at the Menil Collection, the Modern gallery explores many of the movement’s significant artists through massive artworks and in a sort of chronological way that helps to examine the development of these influential pieces. Picasso’s cubist offerings fill the main entry into the gallery before fellow cubist Fernand Léger’s bright, colorful, and clean works lead viewers around the room. Into the next area, the unmistakable large-scale work of Alexander Calder is suspended near the far wall. 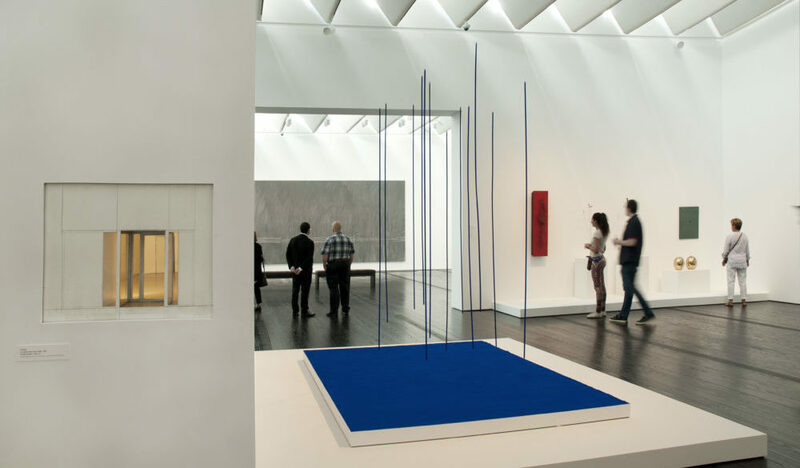 Instead of the often lofty display above the heads of museum patrons found elsewhere, the Menil has brought it down to eye level so that viewers can examine the small details of the counter-balancing mobiles that define Calder’s work. On the opposite wall, just before the next room, two Piet Mondrian works usher in the movement of abstract expressionism. 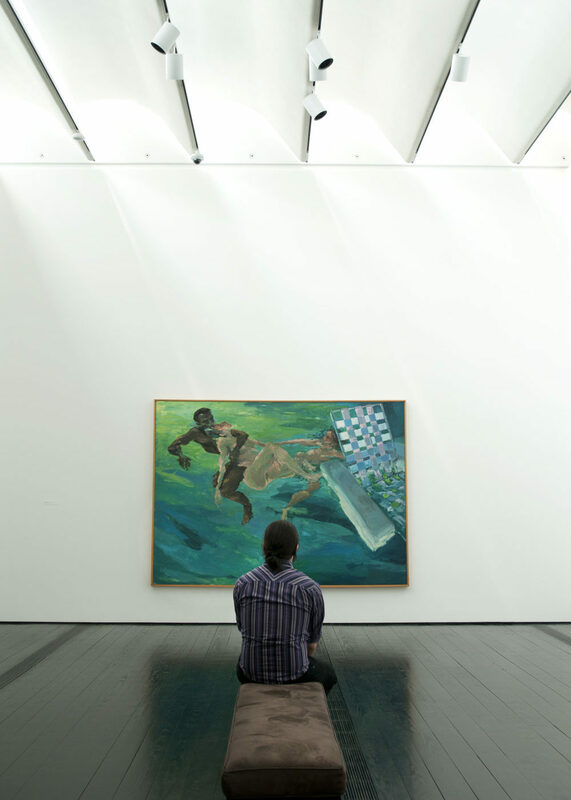 The expansive room that follows serves as one of the most impressive spaces within the Menil Collection. The works that hang by Barnett Newman are provided enough room between them and across the floor so that viewers are able to explore the space, achieving views, and angles that can be difficult in cramped galleries elsewhere. On the other side of the partition in this room lies a series of works that recall the nearby Rothko Chapel. Five Mark Rothko paintings, ranging from small to quite large, hang around an oversized cushion that provides viewers an opportunity to stop and meditate on the bold, colorful works by the American painter, in contrast to the heavy artwork found in the Chapel. A prime spot is resting on the edge of the cushion in front of No. 10 from 1957. Observing the blends of yellows, gold, and white with no distinct edges, a viewer’s calm gaze over No. 10 may lend to them becoming engulfed in the colorful Rothko washes, lost in contemplative thought. This monumental collection of artwork was amassed by French philanthropists Dominique and John de Menil, who emigrated to the United States during World War II. Upon arriving in Houston, the couple quickly assumed roles in the development of Houston’s art culture while amassing over 17,000 paintings, sculptures, prints, drawings, photographs, and rare books. From René Magritte and Max Ernst to Jasper Johns and Andy Warhol, the de Menils would often form close relationships with many of the artists, leading to special exhibitions — sometimes presenting artworks of artists for the first time in the United States. Their work promoting civil rights during the 1960s would also see contributions such as “The De Luxe Show”, an exhibition that was organized in Houston’s Fifth Ward and served as one of the first racially integrated art shows in the United States. Though plans for a museum housing their extensive collection had begun in 1972, it wasn’t until after John’s death a year later that Dominique would pursue this goal on her own. 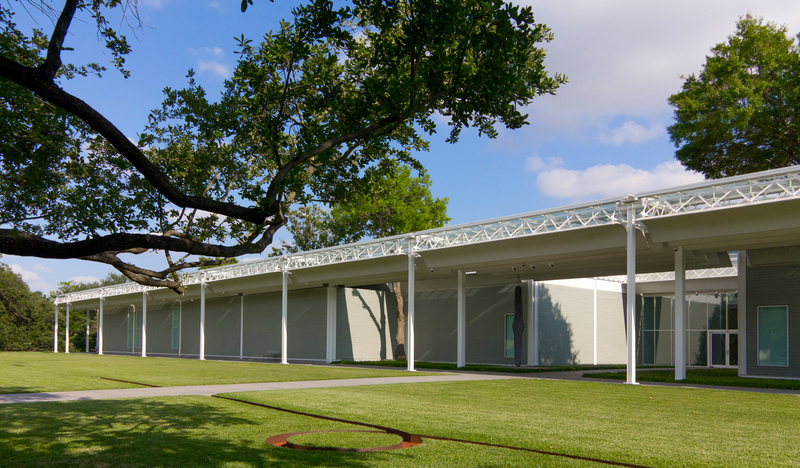 Now, over thirty years since the opening of the Menil Collection, the landmark building hosts a small portion of the de Menil’s substantial holdings, providing a rewarding return visit to patrons throughout the year’s occasional rotations of artworks. Whether you’re around for an afternoon or a weekend, the very walkable Menil Campus and Westheimer Curve offer plenty of must do things as well as restaurants and bars to brunch and happy hour in the heart of Montrose. Adjacent to the Menil Collection’s main building, Menil Park welcomes visitors to enjoy the green, shaded lawns featuring an outdoor sculpture by Mark di Suvero. Popular for weekend picnics, Menil Park also serves as one of the prime relaxation spots in the city for locals. Opened in late 2018 to house many of the Menil Collection’s extensive drawing artworks, the Menil Drawing Institute provides an intimate setting for the public to view the Collection’s holdings and rotating exhibitions. The striking design of the building by Johnston Marklee features spacious courtyards and incorporates natural light for an airy, contemplative atmosphere. Known as a space for meditation and prayer, the non-denominational Rothko Chapel was commissioned by John and Dominique de Menil in 1964. Mark Rothko, an American pioneer of the abstract expressionist movement, designed towering works of blacks, greys, and deep purples that are suspended around the perimeter of the Chapel to encourage introspection. Outside, the Barnett Newman sculpture Broken Obelisk rests in a reflection pool, dedicated to Dr. Martin Luther King, Jr. Opened in 1995, this gallery mimics the “small on the outside, large on the inside” ethos of architect Renzo Piano. Housing 33 paintings and 11 sculptures by the American painter, the Cy Twombly Gallery contains abstract and expressionist works that can be difficult or challenging not just for the general public, but to the sophisticated art enthusiast as well. The innovative lighting structure employed within helps to disperse natural light that lends subtle transformations to the artworks depending on weather and time of day. Over four decades, minimalist Dan Flavin created beautiful sculptural works using colorful fluorescent lighting. With the help of Dominique de Menil, Flavin took over the former grocery store on Richmond Avenue, completing the designs for the work just two days before his death. The expansive Dan Flavin Installation was completed by the artist’s studio, and fills the interior space with rows of colorful lights, altered by the flood of natural light from a protruding skylight above. A small collection of his works extend the installation into a back room at the end of the hall. Intervening in an auction of stolen thirteenth-century church frescoes, the Menil Collection purchased and displayed the works in the Byzantine Fresco Chapel until, in 2012, they were returned to the original church in Cyprus. The Chapel now plays host to a rotation of long-term art installations, including the recent Fabiola Project that displayed hundreds of portraits of Roman Saint Fabiola. Across from the main building of the Menil Collection, the Bookstore features publications on exhibitions, the collection, and special projects, as well as specific facets of art and art movements. Guests can also find a collection of children’s books and toys, as well as other gifts, including jewelry and artwork by Texas-based artists. If you’re hungry for nearby fare, Chef Greg Martin‘s Bistro Menil serves European-inspired American dishes ranging from appetizers to full entrees, craft beers, and wines. Parking: Lot parking is available at 1515 West Alabama Street. Additional street parking is also available on streets surrounding the museum.